This part was launched along with the hub disc, but not included in the Meccano outfits until 1925. Originally known as the "Large Wheel Segment", it was intended to be used along with the hub disc to make an 11 inch diameter large wheel for use in "beam engines, horizontal engines, etc". 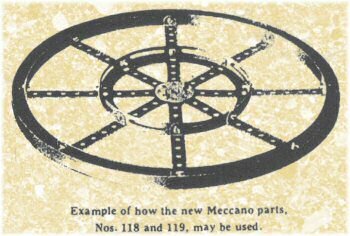 This and the hub disc (then called the "Large Wheel Hub") first appear in the December 1923 Meccano Manuals. Clive Weston has found even earlier UK price lists, August 1923 for the introduction and March 1924 for the new names – we're awaiting scans! In the Meccano Magazine of November 1924, the parts are introduced s "New Meccano Parts". We are getting used to these announcements being a good year behind the actual launch of the part. In fact, the new names of these parts had already been announced in the July 1924 issue, and exist in a Canadian parts list as early as April 1924. The old names were therefore only the official ones for a very short while. Eight were included in the outfit 7 of 1925 (enough to make one wheel), increasing to 16 in 1930 (when 8 were also included in the outfit 6). These quantities continued in the K and L outfits of 1934, but were dropped in 1935 when the part became one of the very first significant obsolete parts in the Meccano system. The 1935 printings of the F-L manual include several models where the picture clearly shows channel segments, but the text explains that these should be replaced by the new Ring Frame (later Large Flanged Ring, part 167b). This would seem to be a cost-cutting exercise, and would have created some disappointing models as the large flanged ring is considerably smaller. Please help us out by describing and photographing any channel segments you have! Email us by clicking on "contact us" above. Although DMS/EMP describe only channel segments with holes on the flat face, the earliest versions had no holes on this side at all. If you look very carefully at the Meccano Magazine extract above, you will see that the Channel Segments are attached to the hub disc by 2½''x½'' double angle strips. This is the only method possible with the first version of the part, shown as part 119.ni in the table below. The channel segments soon gained one and then three extra holes in the flat section, allowing more reinforcement of the flimsy wheel structure, and then most importantly gained a second lug at the other end. Bolting the segments together in both planes was a much better arrangement, and although the bolt head prevents the built-up wheel from being used as a roller guide it does make for a stronger wheel. The photo to the right shows the difference between the end of the one-lug and two-lug versions, commonly known as "type 1" and "type 2" channel segments. Note that there are various different "type 1" channel segments with different holes, but only one "type 2" version. The "Improved Meccano Parts" announcement is in the January 1929 issue of Meccano Magazine, but it seems most likely that this change was significantly earlier, probably mid-1928. Further examples of channel segments will probably help us date this change better. As one of the original "obsolete parts", and a fairly handy one at that, this was a natural choice for a reproduction to be made. Bill Inglis took up the challenge, and it's fair to say that the majority of channel segments you're likely to come across will be of his manufacture. An article describing his experience with these parts is here. In that article he describes how the first couple of thousand made were unstamped, but the subsequent ones are clearly stamped W.R.I., as the example shown above. You might also just notice that the left-hand side hole is not perfectly circular because of the process used (which he mentions on his site), and this key identifier helps you to spot an unstamped WRI part. However, all the two-lug nickel Meccano parts found to date are stamped Meccano. These excellent replicas were only A$35 for a set of eight (which is a fraction of the price an original Meccano set would fetch). These parts are no longer available new as, sadly, Bill passed away in May 2009. Further information is here. Ashok also makes reproduction channel segments, of a modified type where the two lugs oppose each other on the two curved sides. This allows the ring to be stronger than the one-lug "type 1" variant, but still allows a smooth flat surface for use as a built-up roller bearing. Although this is a clever variation, it doesn't represent a Meccano part that was ever made. Now that would be nice. The parts themselves are rare enough, and I've never heard of a spare parts packet, but surely they will exist somewhere. Has anyone ever seen any? Notes: The entries in this table are rather tentative, not least because only one of the entries matches up with the six shown in DMS/EMP, and even then not precisely. Once we have more pictures and information, this table should get better! 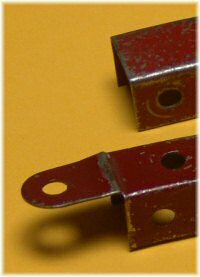 The Channel Segments are painted red before they gain the extra holes and lugs, however we can safely assume that these later types were available as a special order part in nickel plate, along with most other parts. The entries above are therefore theoretical, but likely to exist. I sell the 8 Channel segments nickel plated with Meccano stamp if interested let me know. I have 8 Channel segments nickel plated and stamped with Meccano. I can send pictures of them if interested. I have four of these channel segments which a friend has asked me to sell for him. I do not know how old they are but if you would like pictures please send me an e-mail address.